Laid down, 26 December 1944, at Bethlehem-Hingham Shipyard, Inc., Hingham, MA. 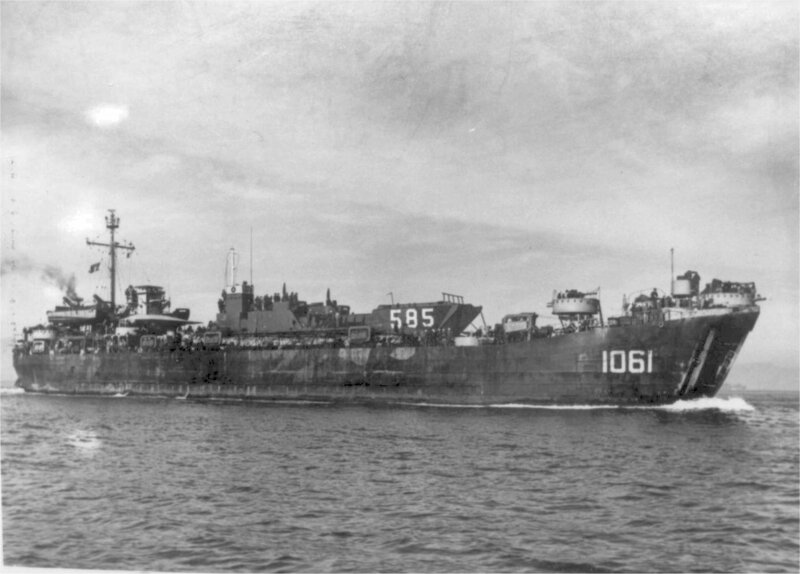 163k USS LST-1061 with LCT(6)-585 loaded on her main deck arriving in San Francisco Bay after leaving Okinawa where she was damaged during Typhoon Louise, 9 October 1945. Note starboard bow door is missing. US Naval History and Heritage Command photo # NH 82174. Courtesy of Donald M. McPherson, 1975. Robert C. Smith, Archivist US Navy Memorial Foundation, courtesy Timothy J. Scott for his father, Walter F. Scott, MOMM3/c, USS LST-1061 1945-1946.